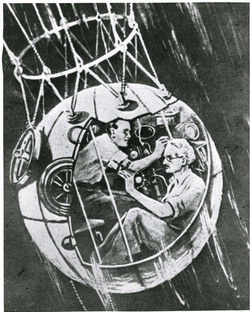 Swiss physicist Auguste Piccard conceived and designed a sealed, pressurized gondola that could safely carry him into the upper atmosphere to conduct scientific studies. In 1932 Piccard and assistant Max Cosyns (shown here with Piccard on the right) ascended in the gondola to 52,500 feet. Their flight attracted wide attention and inspired other researchers to plan high-altitude flights. 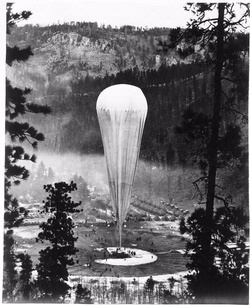 Piccard inspired other researchers to undertake high-altitude balloon flights. From 1931 to 1939, Belgium, the U.S.S.R., Poland, Spain, and the United States repeatedly attempted to capture and hold the world’s absolute altitude record. The effort cost the lives of seven Soviet aeronauts on two high-altitude balloons. Three American efforts were mounted, including that of Jeanette Piccard, who became the first woman to reach the stratosphere when she and her husband Jean (Auguste Piccard’s twin brother) ascended to over 57,500 feet in 1934. Twin brothers Auguste and Jean Piccard were not only brilliant scientists, but also the inspiration for fictional characters. Auguste’s likeness was the model for Professor Cuthbert Calculus in the comic strip The Adventures of Tintin. Capt. Jean-Luc Picard of Star Trek: The Next Generation was reportedly named after the famous family.